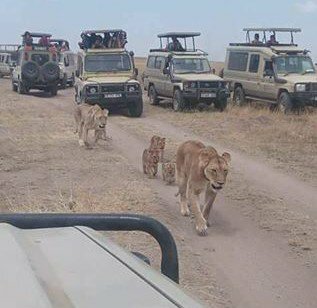 Our 4days Tanzania Safari itinerary is unforgettable tour will take you to the Serengeti Plains National Park, the heart of wild Africa and a massive wilderness of 14500 square km, where every day brings a new landscape and a new adventure. Your African safari will also take you to the Ngorongoro Crater, featuring one of the highest concentrations of game in Africa. Here you will witness an amazing spectacle of African wildlife – inside a self-contained world featuring an unbelievable concentration of animals. Lastly your trek will take you to the Lake Manyara National Park, one of Tanzania’s most dramatically located wildlife areas, consisting of a shallow but huge soda lake, at the foot of the Great Rift Valley’s western escarpment. The size of this national park makes it perfect for a one-day game drive, and is famous for it’s unique tree-climbing lions. The departure dates for all our African safaris trekking packages are totally flexible according to your own personal needs. Please contact us for further and more detailed information, as well as information on our photographic packages, safaris and other trekking packages into Tanzania.